View More In Wreaths - Page 11. 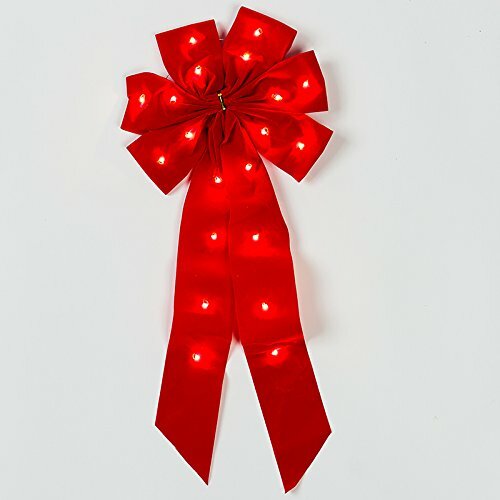 Pre-lit Red Fabric Bow with White LEDs with outdoor battery box and hidden electronic 24/6 hr timer. Ribbon attaches to battery box with Velcro, and the back of the battery box attaches to any surface with Velcro for mounting. Measures about 10" wide and 23" top to bottom. If you have any questions about this product by Mr. Light, contact us by completing and submitting the form below. If you are looking for a specif part number, please include it with your message. Nearly Natural Orchid, Berry & Pine Holiday Wreath, 22"